We introduce TinyMT implemented in CUDA, which is a GPGPU environment by NVIDIA. This program is slower than MTGP and CURAND. Still, we belive this is useful for CUDA users. The following environment are required to compile and execute this program. Environment variables are set appropriately for CUDA executable files and libraries. Compiler supported by CUDA is installed, or you did quick hack. Your compiler supports c99, or stdint.h compatible with c99 is in your include path. The followings are not required. CUDA SDK code samples are not required. Original TinyMT written in C is not required. If you don't use original TinyMT, the outputs of tinymtdc is in TinyMT DATA. The following files are intended to work with kernel programs written by users. The following files are intended to work with host programs written by users. tinymt32_host.h: a header file of tinymt32_host.c. tinymt32_host.c: a file of reading tinymt32 parameters from file. tinymt64_host.h: a header file of tinymt64_host.c. tinymt64_host.c: a file of reading tinymt64 parameters from file. The following files are sample kernel programs which call the functions in tinymt32_kernel.cuh or tinymt64_kernel.cuh. Sample files are out of our support, and Users can regard they are not under our copyright. The following files are sample host programs which call the functions in sample32_kernel.cu or sample64_kernel.cu. The following file contains utility functions for host program to call cuda functions. This tool is only for test program. The error handlings in test_tool.hpp are not carefully designed. Four executable files are made by typing make all. sample32: a sample program for tinymt32. 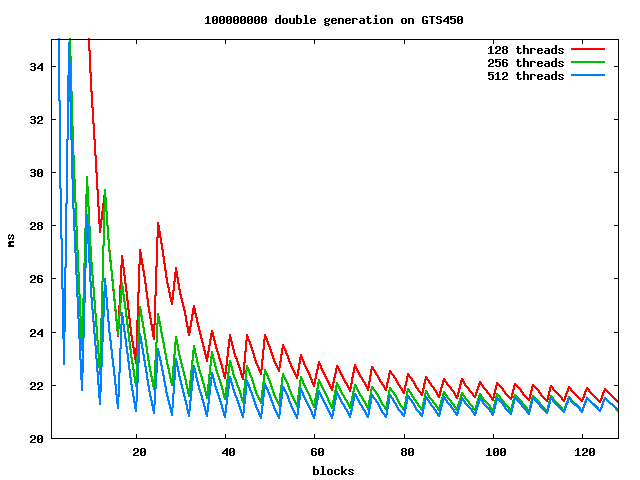 will generate 100000000 (or over) single precision floating point numbers by using parameters in tinymt32dc.0.65536.txt and using 12 and 256 for block number and thread number for kernel program call, and will sum up the generated numbers for each thread, and will show the elapsed time. sample32-test: a sample program which measures elapsed time. sample64: a sample program for tinymt64. sample64-test: a sample program which measures elapsed time. The following graphs are made from the outputs of sample32-test and sample64-test. 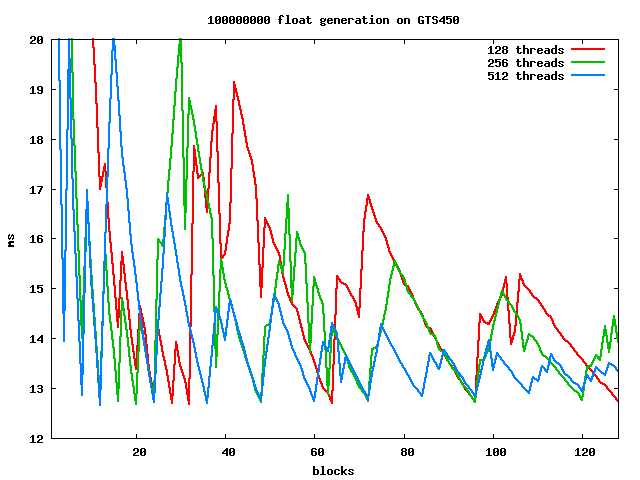 They shows the elapsed time by milliseconds to generate 100,000,000 float and double pseudo-random numbers. x-axis shows blocks and y-axis shows elapsed time by milliseconds.